We are a leading Manufacturer of scissors lift for cars from Pune, India. We are actively instrumental in manufacturing highly durable and easy installable Scissors Lift for Cars. Our offered scissor lifts are used to loading and unloading of cars from one shop floor level to another and can be installed into the civil pit as well as on the floors. Our team design and fabricates these car lifts in compliance variegated demands of markets while considering every industrial norm. In order to serve clients satisfactorily, we provide these scissor lifts at equitable rates. 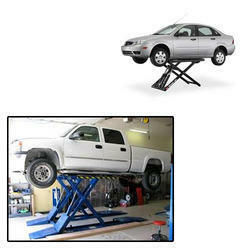 Looking for Scissors Lift for Cars ?